The Health Resources and Services Administration (HRSA), an agency of the U.S. Department of Health and Human Services, is the primary Federal agency for improving access to health care by strengthening the health care workforce, building healthy communities, and achieving health equity. The purpose of the Healthy Start (HS) program is to improve health outcomes before, during, and after pregnancy, and reduce racial/ethnic differences in rates of infant death and adverse perinatal outcomes. This 5 minute video features Healthy Start project directors from around the country describing the essence of the Healthy Start program by finishing the sentence “Healthy Start is…” Grantees can use this video to introduce Healthy Start to community partners, show it at community meetings, or post it on their websites. This video is also available with audio descriptions. Learn more about the history, scope and impact of Healthy Start, in this Special Issue of the Maternal and Child Health Journal, published in December 2017. 1989 President George H. W. Bush creates the interagency White House Task Force to Reduce Infant Mortality with representatives from the Departments of Health and Human Services, Housing and Urban Development, Education, Commerce, and the CDC. 1989 Healthy Start is one of 18 proposals submitted to the White House Task Force to Reduce Infant Mortality. 1991 Healthy Start begins with a goal to reduce infant mortality by 50% in 5 years. Fifteen sites with infant mortality rates 1.5 to 2.5 times higher than the national average are selected to conduct demonstration projects. 1991 These programs were funded to be innovative, community-driven projects tasked with reducing infant mortality and improving the health and well-being of women, infants, and their families. Projects are based on one of nine intervention models: community consortia, coordinated care/case management, outreach and client recruitment, family resource centers, enhanced clinical services, risk prevention/reduction, facilitating services, training and education, and adolescent services. 1997 Forty sites are added to the Healthy Start program with the intention that they will replicate the model of the original programs by conducting outreach, case management, and health education, and developing community consortia. 1998 National Healthy Start Association is founded. 1999 Nineteen sites focused on the elimination of racial and ethnic disparities in perinatal health are added to the Healthy Start program. 2000 Healthy Start is Authorized by Congress as part of the Children’s Health Act. 2000 Kotelchuck and Fine: Healthy Start Initiative: Strategic Assessment & Policy Options (2000) makes 38 recommendations for strengthening the program. Federal and local leadership are re-balanced. 2002 After multiple rounds of funding, there are 96 federally-funded Healthy Start sites. 2002 Healthy Start 2.0 scope evolves to focus on preconception health, developmental focus through age 2 years, screening for maternal depression, father involvement, and consumer voice, in addition to comprehensive health services. 2008 Healthy Start Re-authorization Act is enacted. 2010 After four rounds of expansion and changes to funding, there are 105 Healthy Start sites located in 39 states, Puerto Rico, and the District of Columbia. 2012 Healthy Start 3.0 focused on five pillar approaches: Improve women’s health; Promote quality services; Strengthen family resilience; Achieve Collective Impact; and Increase accountability through quality improvement, performance monitoring, and evaluation. 2013 The Secretary’s Advisory Committee on Infant Mortality (SACIM) issues recommendations and a framework for a national strategy to reduce infant mortality and reaffirms need for continued federal investment in Medicaid; Title Vl MCH Services Block Grant; Healthy Start; Title X Family Planning Program; Community Health Centers; Maternal, Infant, Early Childhood Home Visiting (MIECHV) Program, and WIC. 2014 One-hundred Healthy Start programs in rural, urban, and border areas are funded by HRSA, in 37 states and the District of Columbia. 2016 Twenty-fifth anniversary of the federal Healthy Start Initiative. Introduction to the Health Resources and Services Administration (HRSA): This document provides background on the scope of HRSA’s work and the history of HRSA, as well as the vision, mission, and goals of HRSA. US Department of Health & Human Services Organization Chart: This chart shows the organization of HHS, including where HRSA fits within the overall organization. HRSA Organization Chart: This chart shows the organization of HRSA, including where the Maternal and Child Health Bureau fits within the overall organization. Maternal and Child Health Bureau Organization Chart: This chart shows the organization of the Maternal and Child Health Bureau, including where the Division of Healthy Start and Perinatal Services fits within the overall organization. 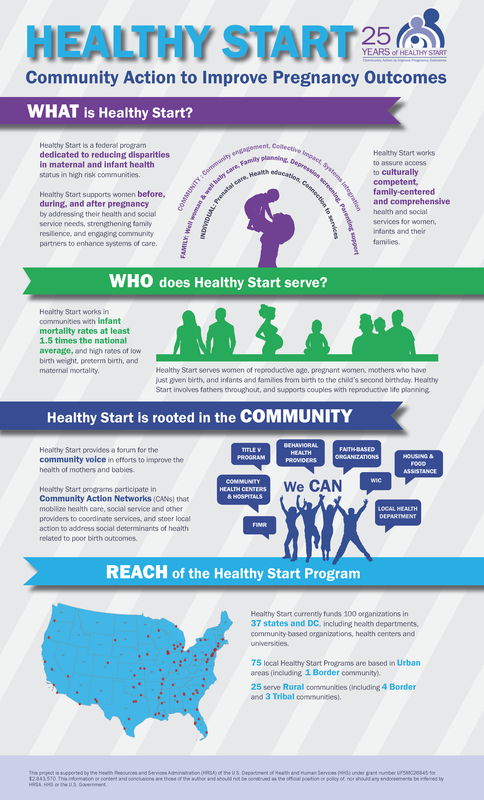 National Healthy Start Association (2015). Healthy Start Initiative. National Healthy Start Association. (2010). Federal Healthy Start Initiative: A national network for effective home visitation and family support services. NHSA, Saving our Nation’s Babies, The Impact of the Federal Healthy Start Initiative. 2nd Edition, First Edition published 2011. Report of the Secretary’s Advisory Committee on Infant Mortality (SACIM): Recommendations for HHS Action and Framework for a National Strategy. (2013). Division of Healthy Start and Perinatal Services, Health Resources and Services Administration, Department of Health and Human Services. (2015). Orientation webinar for healthy start frontline staff. Healthy Start Initiative: Eliminating Disparities in Perinatal Health FOA issued Feb 14, 2014 (HRSA -14-121, HRSA-14-120, HRSA14-122).